Mamelodi Sundowns were the big winners this past weekend in the PSL, without kicking a ball, as their title rivals Orlando Pirates, Bidvest Wits and Cape Town City all dropped points, writes DEAN WORKMAN. Eric Tinkler picked up his first win as coach of the Team of Choice with a vital three points in their fight for survival. The 2017-18 Nedbank Cup Champions flew into a 3-0 lead, thanks to a brace from former Pirates man Thabiso Kutumela and a Mohau Mokate strike. Rise and Shine then pulled one back through Charlton Mashumba with 28 minutes to play, but Maritzburg held on for a vital win. Maritzburg stay bottom with 14 points from 20 games, while Polokwane City dropped to eighth with 27 points from 18 games. South Africa stood still as the two Soweto giants clashed in the 166th Soweto derby on Saturday, Chiefs, who were looking to end an 11-match winless run against their rivals, took the lead in the second half through a Daniel Cardoso penalty. 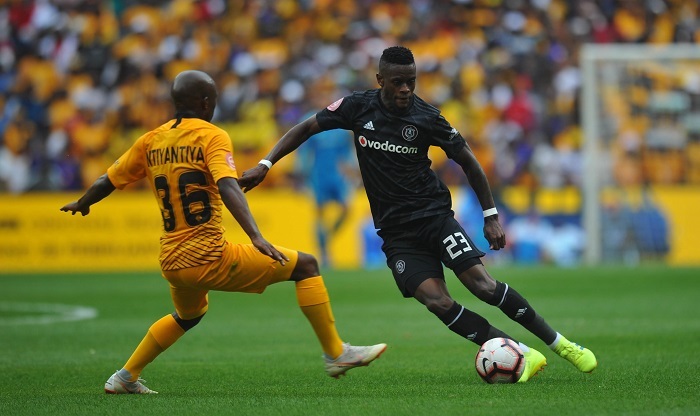 They then sat back, however, and were eventually made to pay as Thembinkhosi Lorch netted the equaliser with 10 minutes to play. The draw didn’t really help either side, as Pirates stay third with 33 points from 19 games, while Chiefs drop to seventh with 28 points from 20 games. Honours even in the big one, but the Bucs will feel a little hard done by not getting the result in the game end after a good number of chances created. The streak continues. Wits went into the weekend knowing a win would help cement their spot at the top of the table. Things did not go according to plan, however, as they came up against a spirited Highlands side despite taking an early lead through Gift Motupa. The Lions of the North hit back with goals from Peter Shalulile and Mokete Mogaila to secure the three points at home. The result sees Wits stay top with 37 points from 20 games, but opens the door to Mamelodi Sundowns in third, while Highlands continue their fine season as they sit in ninth with 25 points from 20 games. Goal Scorers: Peter Shalulile and Mokete Mogaila. It had the look of a PSL relegation 6-pointer at Globe Park, but Stars suffered a damaging loss to a Chippa side who have shown a revival under new coach Clinton Larsen. A penalty in the first half by Ruhlani Manzini got the visitors on their way before Kurt Lentjies sealed the three points late on. The result lifts the Chilli Boys to 13th with 19 points from 20 games, while Stars sit second bottom with 16 points from 19 games. In what can be described as a smash and grab, Ushutu secured all three points against Benn McCarthy’s men in the late PSL game on Saturday. Unbeaten in 7 PSL games, City had a couple of early chances to take the lead as Kermit Erasmus missed a penalty, while Gift Links could not convert when slipped through on goal. The Citizens continued to dominate possession and looked the likelier to open the scoring until AmaZulu defender Tapelo Nyongo hit his free kick into the top corner, leaving Peter Leeuwenbergh with no chance. Cavin Johnson’s men managed to hold on for the three points which lifts them to 11th with 23 points from 20 games, while City missed the chance to move into third and sit fourth with 30 points from 19 games. Phunya Sele Sele were fired into an early lead through Tshegofatso Mabasa, but were pegged back before half-time as a Mpusana Tani own goal and a Mduduzi Mdantshane strike saw Baroka take a lead into the half-time break. Celtic, however, hit back as Mabasa secured his brace in the 72nd minute to secure a point for his side. The draw leaves Baroka perilously close to the bottom two in PSL as they sit in 14th position with 18 points after 20 games, while Celtic are fifth with 29 points from 20 games. Tshegofatso MABASA, the #AbsaPrem Man Of The Match. MABASA scored a brace ( the opening and last goals of the match). @Baroka_FC 2 – 2 @Bloem_Celtic. The weekend concluded with a thriller in Durban as Matsatsantsa edged Arrows in a five-goal thriller. Kaitano Tembo’s men got off to the perfect start as goals from Evans Ruskie and Mxolisi Machupu saw them take 2-0 lead into the break. Steve Komphlea’s men though came out firing in the second stanza and quickly levelled matters with a Knox Mutizwa penalty and a Brandon Parusnath goals with 30 minutes to play. SuperSport then grabbed a late winner through a Teboho Mokoena screamer in the 86th minute to hand his side the three points. The result sees the side from Pretoria move up to sixth with 29 points from 19 games, while Arrows sit tenth with 24 points from 20 games.